Find adventure at every turn on this 14-day trip through Peru. 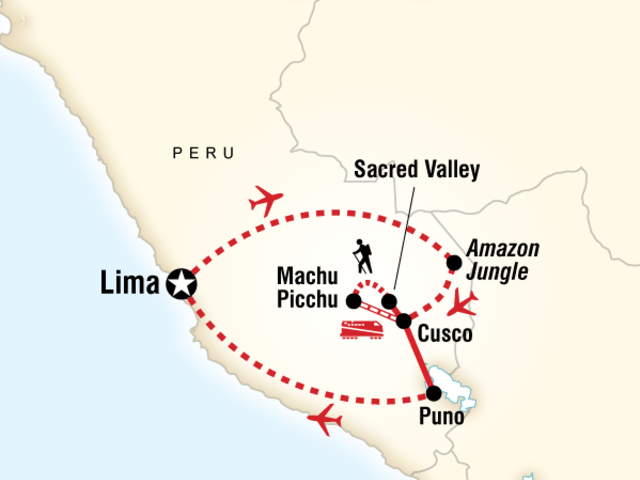 Catch the scenic train to Machu Picchu, or challenge yourself by hiking the famous Inca Trail. Find adventure at every turn on this 14-day trip through Peru! Fly to Puerto Maldonado and continue by motorized canoe to the comfortable, intimate, and exclusive G Lodge Amazon located in the lush Tambopata Rainforest. Enjoy guided jungle excursions led by expert naturalists to spot wildlife at nearby oxbow lakes, rivers, and clay licks. Spend some time relaxing in a hammock, enjoying the local swimming hole then go for a caiman-spotting cruise after dinner. Travel by boat out of the jungle to Puerto Maldonado for the flight over the Andes and into the heart of Inca territory, Cusco. This evening, look to the night sky for a different view at the Cusco Planetarium. Enjoy a presentation on the southern sky, contemporary astronomy, and the ancient Incas’ relationship with the cosmos. Visit the on-site museum and use the telescopes to admire the stars. Enjoy a full-day excursion to the Sacred Valley including the Pisac and Ollantaytambo ruins. Visit the “Parque de la Papa” (“Potato Park”), exclusive to Journeys and part of G Adventures for Good – walk through this rural community with a local guide to learn about potato cultivation, weaving, and the importance of both to Andean culture. Also, enjoy lunch at the G Adventures-supported Sacred Valley Community Restaurant in Huchuy Qosqo, an indigenous village. Depart Ollantaytambo by van to km 82 where the Inca Trail begins. Ease into things with a straight forward day of hiking, the meandering streams, stunning Andean scenery, and ancient Incan ruins will give you plenty to look at. Free day in Cusco - explore this UNESCO World Heritage site at your leisure. Opt to visit museums and ruins or try white water rafting or rock climbing. Drive to Puno, enjoying scenic mountain views. Enjoy a guided boat tour of Lake Titicaca visiting the floating Islands of Uros and Taquile. Explore a bit further afield on the Lake, visiting the Luquina community and enjoy a traditional lunch in local homes. Option to visit the Sillustani burial site. Transfer to Juliaca and fly back to Lima to enjoy your last night in Peru. Contact your UNIGLOBE Travel Consultant today for more ideas about travelling to Peru!